The documents distributed here have been provided by the contributing authors as a means to ensure timely dissemination of scholarly and technical work on a noncommercial basis. Copyright and all rights therein are maintained by the authors or by other copyright holders, not withstanding that they have offered their works here electronically. It is understood that all persons copying this information will adhere to the terms and constraints invoked by each author's copyright. These works may not be reposted without the explicit permission of the copyright holder. Zhao, X.Y. A Superficial View of Digital TV Network in Campus. Science Mosaic (Chinese). 2006, 7: 113-114. Gao, X.F., Zhong, Y.R., Huang, M.F., Zhao, X.Y. PLC Programming Generation of a Control System Based on SIPN. Morden Manufacturing Engineering (Chinese).2005, 12:38-40. Zhong, Y.R., Zhao, X.Y. A Real-Time Interactive Prototype system of Distance Learning. Computer Science (Chinese). 2005, 32(2):147-149. Jiang, Q., Lei, J., Zhao, X.Y. Analysis and Implementation of Node Multiple Frequency Failure Parameters Diagnosing Algorithm Based on IEEE1149.4. Journal of Electronics & Information Technology (Chinese), 2003, 25 Supply. Wan, X., Jamaliding, Q.Zhao, X.Y., Anma, F., Okamoto, T. Using comprehension degree to improve the quality of recommender system for group learning support. The 2nd International Workshop on Education Technology and Computer Science (ETCS2010). 2010(3): 3-6 (V.II). 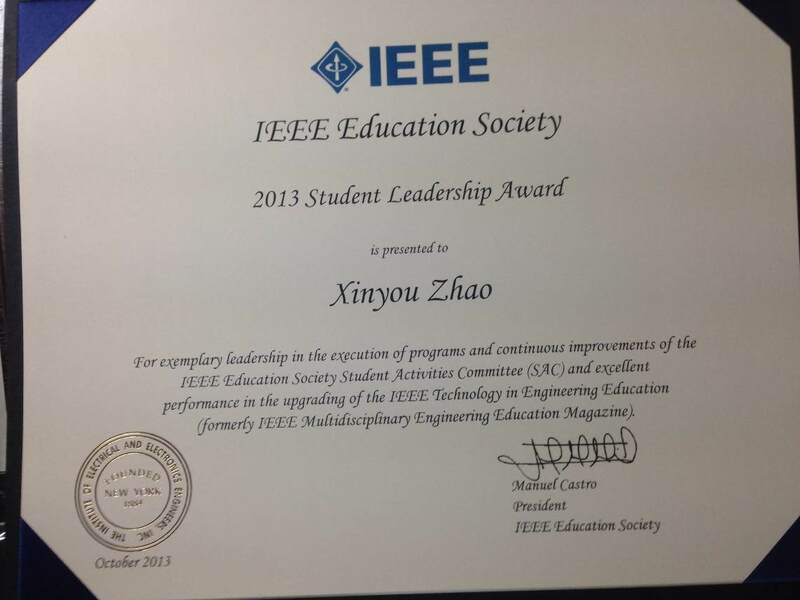 Zhao, X.Y., Okamoto, T. An Email-Based Discussion Learning System with Ubiquitous Device Support. 2009 The 4th International Conference on Computer Science & Education (ICCSE 2009). 2009(7): 1420-1424. Zhao, X.Y., Ninomiya, T., Anma, F., Okamoto, T. A Context-Aware Prototype System for Adaptive Learning Content in Ubiquitous Environment. 2008 IEEE International Symposium on IT in Medicine & Education (ITME 2008). 2008(12):164-168. Zhao, X.Y., Matsumoto, M. An Instructor-Oriented Framework for Real-time interactive virtual Classroom. The 3rd International Conference on Information and Communication Technologies: From Theory to Applications(ICTTA'06). 2006(4):695-696. Zhao, X.Y., Wan, X., Okamoto, T. A Recommendation System Based on Unavailable Items Cached from Searching Engine. 2009 Rakuten Research & Development Symposium. 2009(11):77-80. Zhao, X.Y., Nagata, N., Okamoto, T. Adaptive Discussion System for Ubiquitous Learners. The 5th National Research Meeting of Japanese Society for Information and System in Education (ISSN:1343-4527). 2009(1),23(5): 56-59.